I keep telling people that my kitchen is done, and then I keep doing things to it. Such is life for a homeowner, I guess. 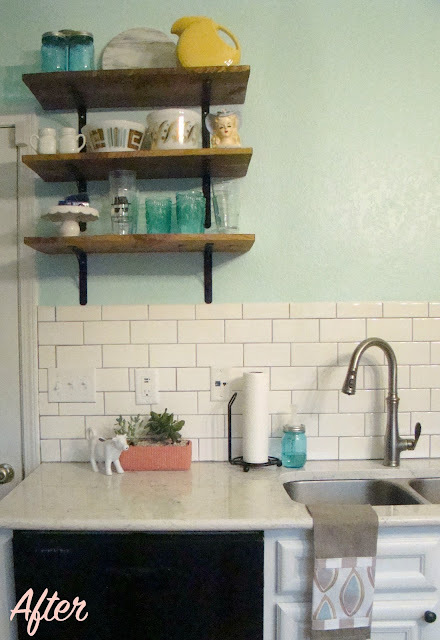 When I randomly decided to tile our backsplash I knew I was going to have to do something about the weird blank wall space above our sink. Our kitchen doesn't have the most functional layout, and it's fairly small. But it's all about working with what you've got! 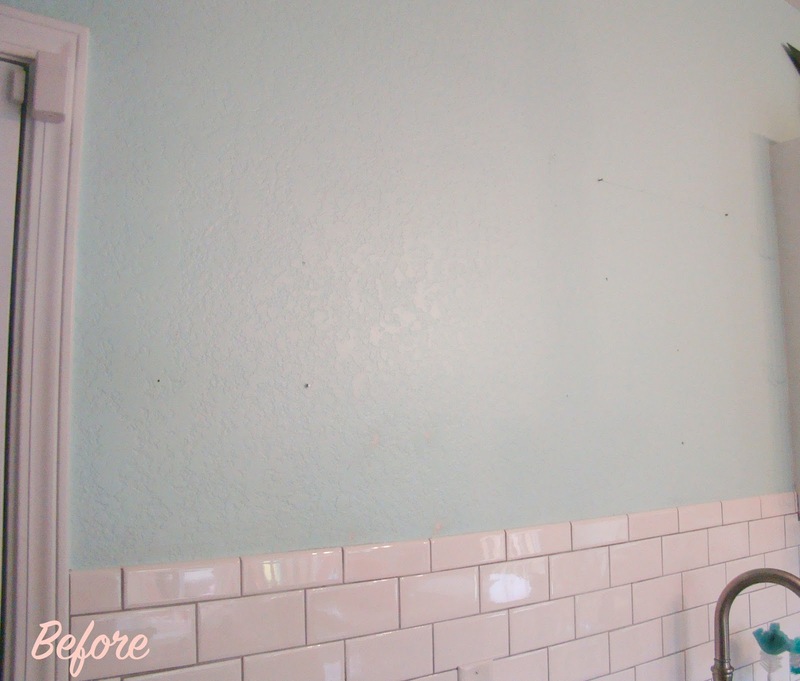 Here it is right after finishing the backsplash, old nails and all! In the past, we had a ton of stuff hanging here all willy-nilly. I know that I'm a busy decorator, but this wall always bugged me. 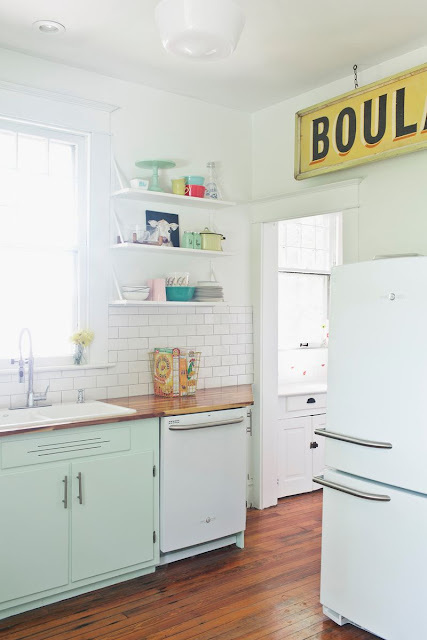 It's easy to fall into the realm of visual clutter, and this wall was all kinds of cluttered. You can sort of see in this old picture. I had my farmhouse window, the control panel for the security system, a hinged box where we hang our keys, some random frames, and my Thirty-One hanging organizer on the door to the garage. The proportions were weird, and it just looked a mess. So I had the security panel moved to the laundry room, and I took the rest down. I looked at that empty wall for awhile, and it almost stumped me. 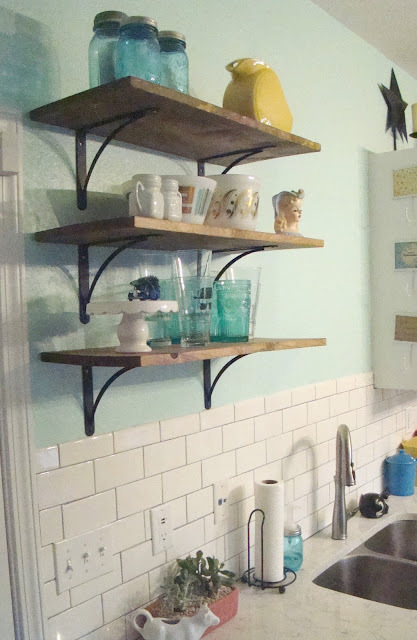 All I knew is that I wanted to hang open shelving in the kitchen. I love a good shelf! They're perfect for adding vertical storage and a home for all my ceramic animals and snow globes and other old lady tchotchkes. I was drooling over this image for weeks. I kept sending it to my mom saying, "Gahhh it's so prettyyy!" Seriously, when you're done here, go look at this entire house. Anyway, I also knew that I wanted to use stained wood shelves to tie in the wood tones from the floor. So in true Callie fashion, I ran into Lowe's on the spur of the moment and had them cut some shelves for me. 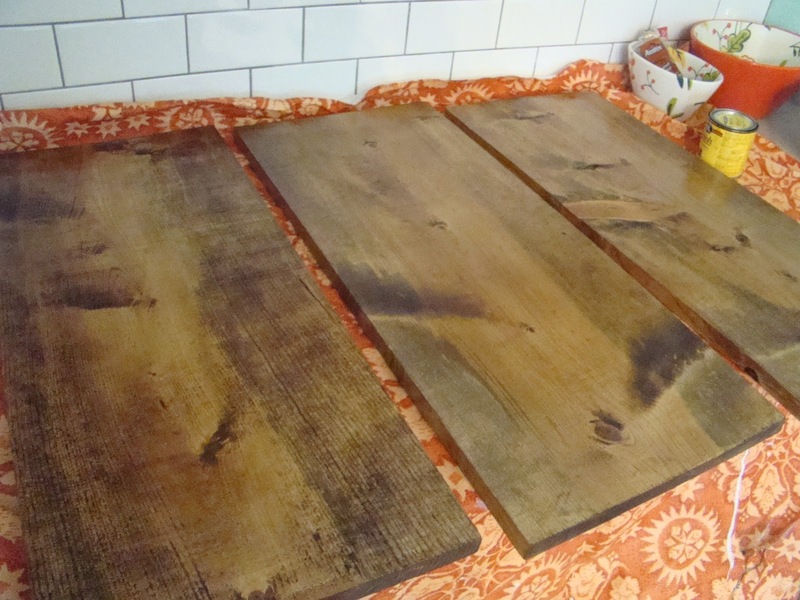 I got home and sanded and stained them with Minwax Early American. I decided to go with a 1x12 board in case I ever want to store larger dinner plates on them. I just went with plain pine because I like the knotty, rustic look it has. I also bought simple shelf brackets at Lowe's in black. And here they are! You'll have to forgive the extra terrible photos. It was monsoon season in Alabama the week I did this, and the lighting was terrible. 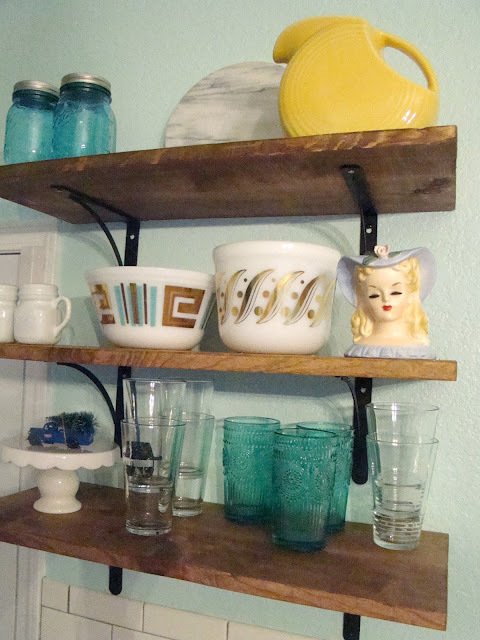 We love having all of our drinking glasses right above the dishwasher, and it's the perfect place to display my lady planter that belonged to my great-grandmother. I also found the milk glass mixing bowls recently, and I'm in love! The tea towel is from The Handmade Home's new studio collection, and it's perfect in my kitchen. That one is sold out, but I'm a big fan of this one too. Is anyone else buying all the Pioneer Woman stuff from Walmart?? I've been scooping up those turquoise tumblers one at a time because that's all they usually have in stock. I like this so much better than before! It's functional and much less cluttered. I may still hang something directly over the sink, like a vintage style schoolhouse clock, but I'm going to live with it this way for a little while first. 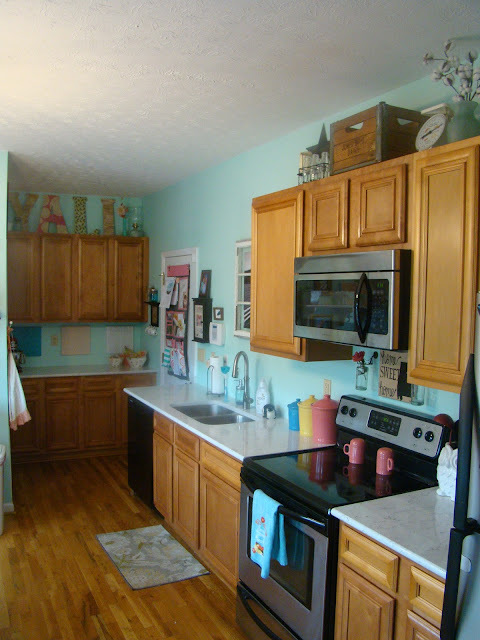 I have more little kitchen updates to share with you next week, plus Christmas!! It's been hard for me to wait this long! What do you think about open shelving in the kitchen? Did you notice my Heisenberg glass? Have you already put your tree up?? I'm loving the Pioneer Woman stuff at Wal-Mart, but I haven't bought anything yet. I just got new stuff like last Christmas, so I hate to buy when I really don't need it. However, I am ready for a bedroom makeover for me--- are you???? I'm already so excited to makeover your bedroom! I think we need a trip to the fabric store very soon!